Firefighters in Gatineau, Que. 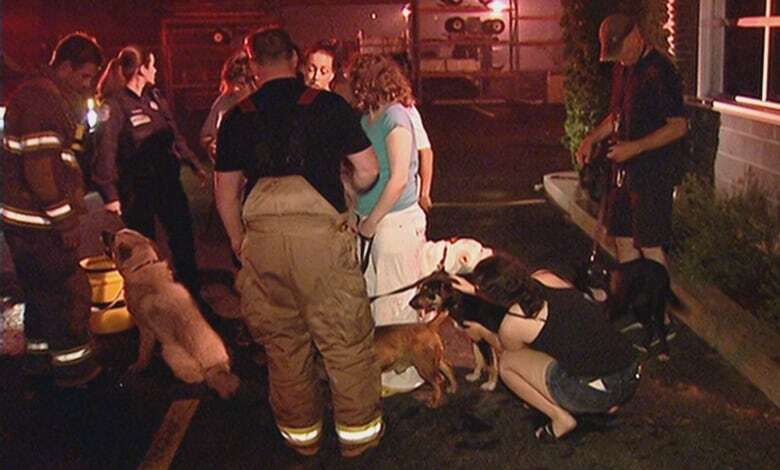 were only able to rescue about a dozen dogs from a blaze that destroyed an SPCA Monday night. Several passersby called 911 at about 10:30 p.m. ET Monday when they saw flames coming from the two-storey SPCA of Western Quebec building at 659 rue Auguste Mondoux in the Aylmer neighbourhood. Firefighters found flames engulfing the roof. The first crew on the scene was able to rescue the dozen dogs, but the building began to collapse before firefighters could save any more animals, said Gary Barnes, the division chief of operations for the Gatineau Fire Service. The number of animals who died in the fire is not known. Lucie Martel, a past client of the animal shelter, knows the configuration of the shelter and visited on Tuesday to assess the damage. "I know where were the cats," said Martel, who adopted a cat and a dog from the shelter. "I think there's no more cats. It's very sad." The Outaouais SPCA on rue Varennes in Gatineau took in six of the rescued dogs. Hydro Québec confirmed there was a power outage in the neighbourhood at around the time of the fire. The provincial energy utility is working with fire officials to investigate the cause of the fire.